Today is Day 8 of our 12 Days of Christmas Giveaway. You can enter each day to win the prize of the day! Contest rules and how to enter are below. On the eighth day of our 12 Days of Christmas Giveaway, my true love gave to me…this Decorative Christmas Card from Scrapbook Adhesives by 3L! 1 – Use your die cut machine to emboss your card with a winter theme. I used an embossing folder with lovely snowflakes. 2 – Stamp your sentiment and cut it out. 3 – Prepare your decorative embellishments: die cut some ornaments and Christmas balls and color a wooden star with red watercolor. 4 – Adhere your sentiment and one of the Christmas ornaments with the E-Z Runner® Permanent Strips Refillable Dispenser. 5 – Adhere the other Christmas ornament with the 3D Foam Squares White Small and Regular. 6 – You can cut the 3D Foam Squares for smaller, more detailed sizes for little paper cuts and embellishments. 7 – Use the Crafty Power Tape to fix the yarn at the back of the card. 8 – Adhere another sentiment on this place. 9 – Use the 3D Foam Hearts and embellish with red embossing powder for another colored highlight. Yes, you can heat and emboss the 3D Foam shapes! 3L Consumer Products A/S has more than 40 years of experience designing adhesives for the creative industry. The Scrapbook Adhesives by 3L® brand was introduced with the focus of providing a full-line of rigorously tested and approved adhesives that are safe for all your crafts. You are our inspiration to provide the most reliable, easy-to-use adhesives to suit any paper crafting need. Our guarantee leaves you free to focus on your craft! Santa vs. Frosty the Snowman, Who’s your favorite and why? I like Frosty the Snowman because at least he is a fun make-believe character. All Santa does is disappoint me every year when he doesn’t give me any presents. I love doing arts and crafts! Now that my Granddaughter will be moving in with us I am going to be loving it even more! Santa is my favorite because he brings the gifts. Frosty of course. I love snowmen. I collect all kinds of snowmen. Santa is my favorite he has the magic of Christmas and the flying reindeer. Santa…I still believe in the magic! what to do with. So, I collect snowmen and start sitting them out in every room, starting the first of Nov.
Santa…it’s all in the magic of Christmas. See the kids’ eyes lighting up when they see him….it’s priceless ! Frosty because snowmen is are around longer then Christmas Santa’s. I love the elegance of the ornament card with the snowflake embossed background, it’s simply perfect! I love Frosty the Snowman! I am so hoping he brings a white Christmas for us this year. Santa. If you don’t believe you don’t receive. Frosty wins because snowmen can be around all winter. Santa….if you don’t believe……he won’t come. Snowmen!!! 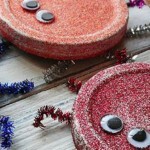 They keep things fun and are a great decoration for the season. I also love that you can have snowmen families and get creative with them! Frosty! For me, a white Christmas is a wonderful gift! I love them both, but since we need to choose, Frosty. The only reason is he is made of snow & I love snow! Never one to believe in Santa or share his tale, it’s Frosty for me! Frosty is my fav because snowmen are magical no matter what your religion. Santa, baby! I believe in the magic of Christmas! I believe they are both magical characters! Santa because its Santa…… Frosty because every “Frosty” is individually, uniquely made with love and the creativity of the people building him! I love the background and ornaments on this card! Perfect! Who doesn’t love Frosty. All of that singing and dancing puts you in the holiday spirit. I like Frosty, because my kids do and it has a good message! I would have to say Santa because in our home, Santa represents everything good about the season. We can all be like Santa and give to others. Love the retro ornaments and the embossed background. I like Frosty–the song is so catchy. Santa is my favorite because he is so magical and makes everyone feel special! I prefer Frosty because snowmen can be used from Nov. to March whereas Santa is just at Christmas. Besides, I love to belt out “Frosty the snowman” more than “Jolly old St. Nick! I like to make sock snowmen too. Now, this is a prize you can stick with! Thanks bunches for the chance to win it. HAPPY HOLIDAYS! Santa is my favorite. He brings joy to so many around the world. To me, he is the 1 of the faces of Christmas. The other, of course, is Jesus. Santa is my favourite, he is making children happy all over the world. Santa is my favorite because he always brings gifts! I love Frost the Snowman because he is helpful and willing to go the extra mile to help others even if it means sacrificing his own comfort. Frosty the Snowman! Always loved the TV show and the song. Means even more to me now that my mother is gone. She collected snowmen. I have just a few around the house, year round even. I like Santa the best because there are so many different Santas of the world. Frosty is my guy! He’s such a friendly cheerful character with no strings attached. I’ve watched him on TV since I was a child and like he says, he’ll be back, and he is. Everyone can enjoy snowmen. Make them with snow, or a white sock stuffed with another sock. Snowmen are affordable for everyone and fun to make together. One caution… making snowmen may lead to hot cocoa! These amazing products make me feel so creative. Thanks for all your creativity in producing just beautiful products. Merry Christmas. Definitely Santa! He brings the presents and Frosty is too cold! My favourite is Santa because he brings the holiday cheer. The kids find him jolly, mystical and it makes them so happy. Santa is my favorite because he is accepted nearly worldwide. So many countries have their own version of Santa, all representing the same wonderful characteristics, kindness, peace, charity, love, giving, acceptance, and generosity. Santa is my favorite because he makes you want to believe in the magic of Christmas. There is good in everyone. in one and not the other. Frosty… I think it’s because of the story connected to Frosty that I like him so much. I vividly remember the Golden Book Frosty story that my father used to read to me when I was a child so Frosty brings back fond memories. I love that snowflake embossed background and all the fab dimensional layers on this card! Scrapbook Adhesives by 3L is one of my go-to adhesives for cardmaking!! I always liked making snowmen when we lived up north, so Frosty the Snowman! My favorite is Santa. I’m obsessed with vintage pictures and objects. I love old pictures of Santa. My tree is decorated with various versions of Santa over the decades. I love how kind and generous he is. I love the various origin stories, how St. Nick came to be the modern Santa we know and love. I have to go with Santa! He’s jolly and bring presents! He keeps the Christmas spirit and childhood alive in all of us! Frosty is my favorite because he’s around all winter long…and who doesn’t love his song! Santa, I still believe! I love this card, thank you for the directions. Scrapbook Adhesives by 3L is my favorite. It was a hard decision. Both seems to bring cheer. Since i have to choose one I am going to pick Santa. Santa has a magic about him. He makes you smile and just really take in the season. I can’t frown at Santa. Mlwhen ky son asked yeasrs ago if he was real, i told him it all depended what he believed in. I still believe, because it is the magical time of year. Such fun! Hmm.. Santa I think. He was such a large part of our Christmas traditions with many breakfasts with him. Now that the children are 28 and 32, my husband dresses at Santa and we do pictures at home. So the tradition continues! Frosty hands down !!! after all Jesus is the reason for the season !! Who can resist the snow it’s so beautiful when it’s falling ,and no one seems to care that it’s cold outside then it’s the most beautiful time of the winter when we have that beautiful blanket of whiteness then you get to build a snowman that will last a little longer after the snow is gone. I like Frosty more, because how fun would it be for a creation you make to come to life and spend the day with you. It just always made me sad that he melted away by story end! Santa is the favourite – how can he not be! As soon as his name is mentioned the kids turn on their good behaviour and act like angels! Christmas wouldn’t be the same without Santa! He truly makes it magical! Frosty the Snowman is my favorite because he reminds me of my childhood when I enjoyed making snowmen with my friends and relatives. i like frosty the most. he is my favorite. I like snowmen better, not a Santa fan. Baby Jesus is more important in our house, but the kids voted for Frosty since its -15 with the wind chill here. Frosty is my favorite. I’m not even sure why. Santa, as he is not made of snow and with the blizzard raging outside now, I could use less snow! I love Frosty. Frosty the snowman was a jolly happy soul with a corncob pipe and a button nose and two eyes made out of coal. It the song I remember. Santa, of course! It doesn’t snow where I live. I like Santa because he represents a spirit of giving and is kind to children. Frosty the Snowman, because I was born on a snowy Saturday many years ago and enjoy the snow and making snowmen. I think Frosty, because he is more fun to color and design cards with and you can use him the whole winter season. I love Frosty The Snowman just because he is one jolly snowman, and we still can watch and read the story all winter long, not only on Christmas 🙂 And… I have 2 daughters who love Frosty! Thanks for the fabulous inspiration today! Snowman as I LOVE SNOW… we got 5″ yesterday.. so beautiful and definitely lets you know the holidays are here..
Frosty the Snowman because I think that he is cheerful and fun! I love them both! Christmas is my favorite time of year and I believe in the magic each one of these characters bring! It wouldn’t be Christmas without the jolly ol’ St. Nick or the promise of snow the Frosty brings. It’s part of the magic. I love Santa because he is always so jolly and happy. He is the tradition I grew up with! I would say Santa because he is golly and gives out gifts! I love Frosty the Snowman. The movie was one of my favorites when I was little. Beautiful card! I guess I would say Santa because he embodies the spirit of giving. I am picking Santa because he gives presents and makes people happy. On the project shown I love the selected snowflake background. It makes everything else work together. I was also happy to find out that you can heat emboss the foam heart. Frosty – he can be around more than just at Christmas! I love Frosty. He is so innocent and even though he is made of snow, just seems so cuddly. I love making cards, especially Christmas cards. I’ll certainly use this project as inspiration although may put my own spin on it (different colours etc.). Since I send 50+ cards I need to start in January to have them all done by next November as there are also birthdays etc to do. I sure use a lot of adhesive. Any card supplies are great but especially adhesives tget used constantly. My favorite is santa, because he is the ultimate symbol of holiday gift giving. Santa; I can sit on his lap. I have to pick Santa. How can you not love a jolly old St, Nick. Santa is my FAVE because he is Christmas…for kids. We take photos with Santa, leave him cookies and milk, he comes down our chimney and leaves all good boys and girls presents and is just a right jolly old self/ We sing lots of songs about Santa. Frosty is a close second. I Love Frosty-but Father Christmas is whimsical! Santa is my favourite. He IS magic & Christmas. Frosty although cute is just winter, cold. I like Santa because he is very giving and encourages kids to be good. We always tell our kids about the story of Saint Nicholas. Santa Baby…I love how he gives with the only caveat is to be good. I love his history, no matter what it is. I must like Frosty the Snowman because most of my Christmas crafts this year were snowman related. As we were decorating this year I also realized that most of our decorations were snowmen. I love Santa the bestest! Who doesn’t love a jolly guy that brings a ton of other people happiness and cheer! I would like Santa Clauss bring me a E-Z runner grand and the refils. Although I love Frosty, I have to choose Santa. Santa is more than a person, Santa is the warm feeling of sharing presents and/or time with people you care for. For me Santa rules and not just at Christmas. I love Santa because he is pure love. Frosty he is so cheering friendly!!! Santa is my favorite, because he was a real person, and he lives on through the people who continue to follow in his steps by making people happy! I love Santa – he brings the magic of Christmas to everyone. Frosty is my favorite! I love his playful disposition!! I absolutely love arts and crafts but due to my husband being out of work due to illness it’s been hard to be able to afford anything…. ahhh!!! Thats so hard! I love them both, but I have to give it to the big man in red… his magic is believed and seen by all in the Holiday season and I just love my children’s faces when they see him for the first time each year. Santa is my favorite; he is the face of Christmas. Snowman is my favorite as he is so cute!!! I would have to say that Santa is my favorite. He is magical and brings joy to all. Christmas is our favorite holiday. Of course, I will always love Santa. But for decorating and card making, I love snowmen. Santa is my favorite because he brings children around the world happiness and the magic of the season! Frosty the Snowman is my favorite because snow is a magical thing! I like Santa! I mean, presents are so fun! Santa because of his many stories. I would say Santa. He is the one who represents Christmas for a lot of children. He brings delight to children’s faces and ignites their imaginations. and Santa doesn’t melt like Frosty. frosty as he is cute. I love Snowmen. They are with you for months and then they gradually go away and Spring follows. Frosty is my favorite! Something about a snowman that I just find charming. I collect snowman ornaments and have always been partial to them! Santa…because he showcases the best in all of us. Santa! I believe in the magic and joy of Christmas! Santa is my favorite because he could appear with presents very soon! I love Frosty the Snowman! It’s one of my favorite Christmas cartoons! I would have to say Frosty. He was alive and happy and free, and the children loved him. Sadly, they lost him, buy he is forever in our hearts. Frosty. As a kid I’d try my best to build one but our snow most of the time wasn’t wet enough to stick together. Santa…he lights up my son’s face so how can I not? My favorite is Santa since he is much warmer and more cuddly. i will say Frosty because his story is so sad..
Santa cuz everyone wants to see him!! I love Frosty because there are so many craft and scrapping things that I could do with him. Santa is my favorite, because he represents the spirit of giving, of which presents are the least part. Santa Claus is my favorite, because he was originally the Turkish bishop who became St. Nicholas, the patron saint of children, and known for his generosity. His spirit is that of giving. Frosty the Snowman because he quickly reminds me of the days as a child when the five of us and our friends would build huge snowmen on our lawns. Many houses were unoccupied at one time and it made a huge area going from yard to yard rolling the snowman parts. Today I love seeing the different snowmen built on the lawn of the homes after significant snowfalls. The many designs are so amazing!! Only wish it didn’t have to be sooooo cold to make the good ones. And the Holiday card as today’s project is amazing. can’t wait to make them for next year. I like Frosty the best because he is just happy and silly and tons of fun for the kids. Frosty is my favorite because he’s lively and fun and there for everyone through the winter whereas Santa is only there for one night. Vintage Santas are my favorite of the two. They are so friendly looking. Santa of course! Looking at the man in red reminds me of all the things we should try to be. Kind. Giving. Jolly. I like Frosty the Snowman the best. After Christmas, Santa is gone for the whole year. Depending on where you live as long as there is snow, Snowmen decor can be lift out for several more months. Santa because he brings joy and happiness to the children. Santa of course! I was never much of a fan of snow. Santa of course.. a jolly man, and gifts! I love Frosty because it was my favorite Christmas cartoon. I loved watching it every year with my mom. I unexpectedly lost my mom this year so watching it was bittersweet. Santa is my favorite because he is the one who gives presents to everyone. Love Santa! Always have and always Will! Scrapbooking Santa is my favorite Christmas Past time! Santa….he’s red and cheerful, although Frosty is so cute, why did you have to make this so difficult?? lol. I’m torn. Frosty! He gets to stick around a little longer than Santa! I like Santa best! I love the traditional Christmas and how excited the kids get about Santa. I love them both, but Santa used to come down the chimney, so I will have to go with him. Santa, he brings gifts! Frosty only dances! I like frosty. He’s fun. Santa – I love all of the fascinating lore that follows him through different cultures, and his ancient-ness makes him appealing on a deep level. If you saw my house. I think it would be pretty obvious that Santa is my main man. I love all the incarnations and various beliefs and customs of other cultures surrounding the jolly old elf! He kind of represents hope! Frosty wins over Santa for me. I love his kind spirit. Love the Christmas card! Frosty – he can hang around till the sun melts him away! Frosty for sure. I love snowmen and have a collection of them.